The invitation letter for a car demo is needed when the company has launched a new car and wants people to come and see the newly introduced car and its new features. This promotes the company and can also boost the sale of the car. Since this letter is important to be sent, the invitation letter should be written in such a way that it can enforce the reader to attend the event of car demo. 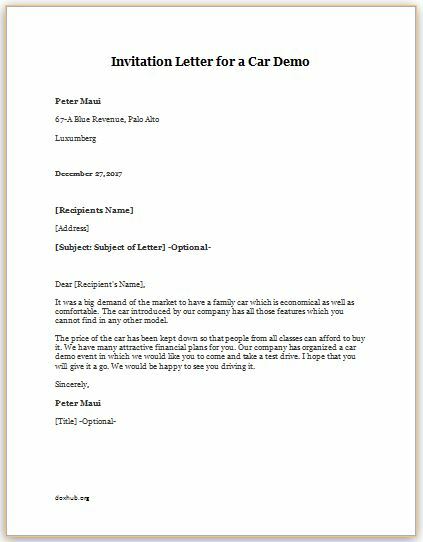 The invitation letter for a car demo should be written in a positive tone so that the event can be considered as a cheerful activity by the reader. It should be clearly indicated in the letter that the presence of the reader is required in the event. The most important part of any invitation letter is the details of the event where the reader is being invited. The letter cannot be considered complete without including these details. The main details of the letter are the date, time and place of the event. You can also include the names of other attendees in the letter. The main part of the invitation letter for a car demo is to mention the objective of conducting the car demo. The introduction to the company conducting this event should also be given in the letter. Make the reader well aware of each and everything about the company. Usually, the car demo event is held to promote the company and the car. The presence of people you are inviting is very important in the event. In order to make the reader attend the event, you can add some persuasive statements in the letter. The tone of the letter should be professional and it should include all the details required by the reader. The invitation letters are not too long so, you can omit some unimportant details from it to keep it brief. The tone of the letter should be positive and the language should be easy to understand and non-technical. It was a big demand of the market to have a family car which is economical as well as comfortable. The car introduced by our company has all those features which you cannot find in any other model. The price of the car has been kept down so that people from all classes can afford to buy it. We have many attractive financial plans for you. Our company has organized a car demo event in which we would like you to come and take a test drive. I hope that you will give it a go. We would be happy to see you driving it. The letter should be written on the letter headed page of the organization. End the letter with a positive message. Write that you expect the reader to come in the car demo event. Thank the reader for reading the letter.